Raymarine Dragonfly 4PRO has an average rating of 3.83 out of 5 based on 6 user reviews. Raymarine recently introduced the Dragonfly 4PRO in the latest generation of affordable fish finders. Though new to the market, the product has already garnered attention. Pacific Yachting recently awarded the Dragonfly 4 “Best in Show” at the Vancouver International Boat Show. Improvements in the new series include clearly marked zoom in/out, back and power buttons along with a simpler 4-way direction and enter button. The attachment mechanism is also much improved and merely requires screwing the unit onto the base via a large locking collar. The ball-and-socket design of the attached unit provides swivel rotation to whatever angle desired. The waterproof unit is user friendly and ready to function out of the box within minutes, and the 4PRO is appropriate for use in fresh or salt water locations. A 4.3-inch, LCD screen provides images in high-definition 480 x 272 WQVGA resolution and in a 16:9 aspect ratio. With highly advanced, built-in optical bonding, images have brighter colors and sharper contrasts. The technology also means that the image is viewable at various angles. This feature was only previously offered on models costing significantly more. The device is additionally fog-resistant. The Dragonfly 4PRO comes equipped with the latest sonar technology that modern-day anglers have come to enjoy. The 50/200 kHz and 83/200 kHz dual channel CHIRP pings wide conical-shaped beam pulses over multiple frequencies that create a conventional image with a greater degree of clarity compared to single signal transmission electronics. The CHIRP DownVision technology emits a wide 60 degree x 1.4 degree fan-shaped signal that creates a crisp monotone display for photograph-like images of what lies beneath the water’s depths. Both sonar applications emit and receive signals that create images in depths of up to 600 feet. The integrity of the images displayed enable anglers to view schools of bait fish, game fish, vegetation and inanimate terrain features. The Dragonfly 4PRO also allows for single or split-screen illustrations. The image displayed also includes easy-to-read large numerals that depict of object depth and vessel speed. An additional sensor in the transducer provides water temperature. The new Dragonfly series features an integrated Wi-Fi mobile app that effortlessly connects the fish finder with a smartphone or tablet. So when multiple anglers are on board, each receives the action as it happens without having to strain to see the same screen display. The app also conveniently rewinds or captures still images. The unit comes with a factory-installed 50-channel GPS/chartplotter and C-MAP that allows high-speed tracking of lakes, rivers and coastal locations found in the United States. The GPS function allows anglers to plot up to 150 routes, 3,000 way points and 10,000 track points. A micro SD card slot makes saving or transferring routes or points from the unit via a SD card to another device. The SD card also provides the user with the ability to download software upgrades directly from the Raymarine website. The Dragonfly 4PRO is also compatible with Navionics or Raymarine’s LightHouse charts and maps. Small enough to hold in the palm of your hand, the Dragonfly 4PRO is easily transferred and used whether in a canoe, kayak or any size motorized boat. The plug and play feature combined with quick detachment makes the unit easily removable and stored for safety. The wealth of features and economical price make the Dragonfly 4PRO a highly-desirable product. 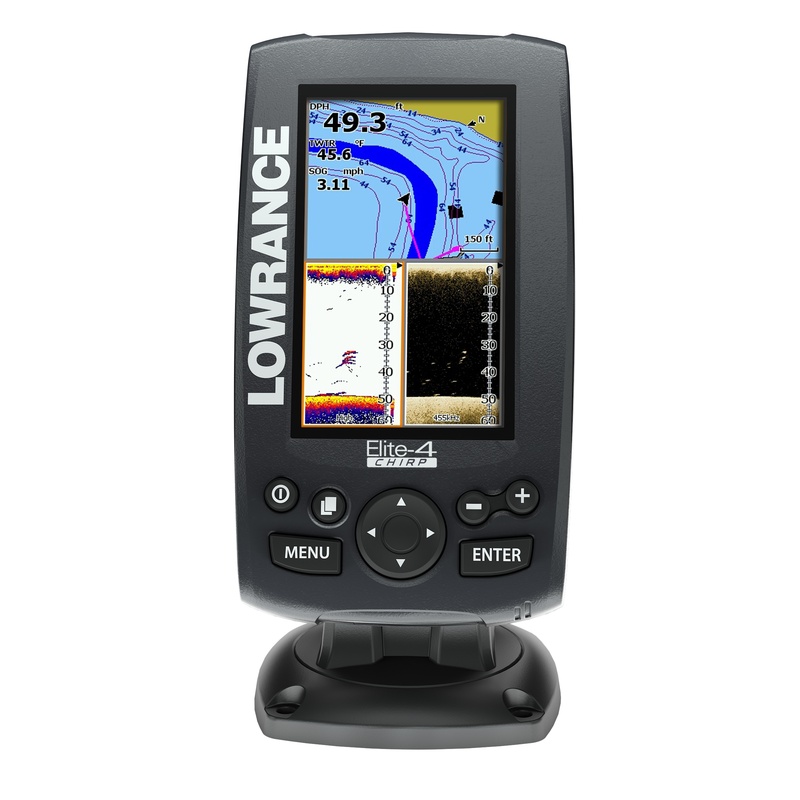 You can get a great deal on Raymarine Dragonfly 4PRO here. My unit arrived quickly after I placed my order and was easy to install. The display is nice and so far easy to see in fairly bright light. I opted to spend the extra cash for the Navtronics+ map pack, but was pretty let down when I couldn’t find the sonar maps once it was installed. The GPS maps are great but the sonar was my main reason for spending the extra money on the + pack rather than going with the Navtronics Gold. The lack of sonar maps is very frustrating, but that is an issue with the map pack add-on not the unit itself. Image quality is fantastic and well above what I expected out of a unit in this price range. It does a good job of locating fish even when moving (as long as you don’t go too fast). Keep it under 20 knots or so and you should have no problems. The controls are easy to use and the learning curve is not too steep. The included instruction manual is kind of limited, but you can go to Raymarine’s website and download a very detailed manual in pdf format. I think I am going to be happy with my purchase aside from the money I wasted on the wrong map pack. Down the road I may buy another set of maps for it , but it works well enough the way it is for now. This is a budget unit so you can’t expect it to be as fast the high end fishfinders but it gets the job done. I think this model is much better than any other in this price range. It’s very accurate thanks to CHIRP, you can get it with Navionics Gold maps, the screen quality is outstanding. If you’re bothered by the small size of the screen you can stream display to your ipad or android tablet which is a very cool feature not supported by any other unit in this price range. Overall I’m very happy with this unit. Very good unit.it works perfect. Clear images and finds fish very well. Bought the dragonfly 4 with essentials to save money was told i could download c-map 4 d charts for free since i have essentials but it only lets you download the vector witch doesn’t have but but about 5% of cartography that noaa charts have . Called c-map and they sent me pictures of the area i need saying it is the same as noaa charts, evidently they never have seen a noaa chart.If i want better charts i have to pay another $120.00.plus it only shows numbers for fish, no alarm just fish alert when turn off makes the numbers disappear. Plus it takes 5 to 8 minutes for the screen to come on after hitting the on switch. Should have spent $70 more and bought a Garmin with blue chart preloaded.Who ever wrote the review that i saw rating this one in the top 5 never compared it to a Garmin or they work for ray marine and don’t be misled by free mapping it’s just the vector which is an outlet to purchase the maps. Love my DragonFly 4Pro on the Yak! Great screen in bright sun. Worried about small screen but not an issue.